Johns Hopkins University’s Applied Physics Laboratory has received approval from NASA to transition to the final assembly and design phase a spacecraft for an asteroid deflection mission. NASA’s Double Asteroid Redirection Test spacecraft aims to shift the orbit of an asteroid in the Didymos binary asteroid system to demonstrate the capability of the kinetic impact technique in protecting the Earth from a potential asteroid impact, APL said Thursday. “With DART, we want to understand the nature of asteroids by seeing how a representative body reacts when impacted, with an eye toward applying that knowledge if we are faced with the need to deflect an incoming object,” said Andrew Rivkin, co-leader of APL’s DART investigation. “In addition, DART will be the first planned visit to a binary asteroid system, which is an important subset of near-Earth asteroids and one we have yet to fully understand,” Rivkin added. 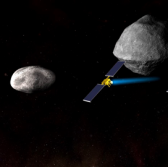 DART is slated for launch in 2021 to Didymos to strike the smaller asteroid in the binary system using an APL-built onboard targeting tool at a speed of approximately 3.7 miles per second. APL, which started the preliminary design phase in July, oversees the DART development program for the planetary missions program office at NASA’s Marshall Space Flight Center in Alabama. Aerojet Rocketdyne, NASA’s five other space research centers, two universities and a national lab support the DART program.